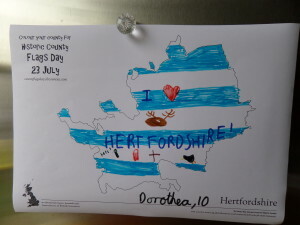 In the run-up to Historic County Flags Day – 23 July 2014, the Association of British Counties is pleased to publish county colouring sheets for the event. Historic County Flags Day aims to get as many county flags flying across the United Kingdom as possible on one day, Wednesday 23rd July 2014, to celebrate the nation’s historic counties. As part of the festivities, the Association of British Counties encourages schools and clubs to join-in, and the colouring sheets are a perfect activity for the day. County flags represent an identity for a county – but children will have diverse ideas of what their county means to them. The sheets can be used to colour-in or embellish an existing county flag, or even create a whole new imagining. 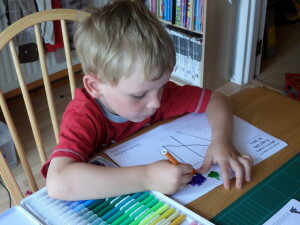 The county colouring sheets can be an exciting way for children to explore what their county and community means to them. Schools and clubs are invited to join the general public in submitting photos of their county flag flying, as well as the outcomes of activities on the day to countyflagsday@abcounties.com or on social media via the hashtag #CountyFlagsDay. Historic County Flags Day is an initiative of the Association of British Counties endorsed by the Flag Institute and the Department for Communities & Local Government. 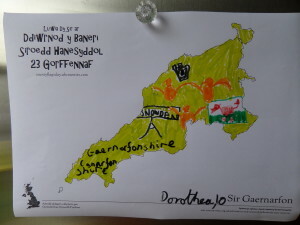 The Historic County Flags Day colouring sheets are available via the Historic County Flags Day website (http://countyflagsday.abcounties.com/countycolouringsheets/), and include sheets for each of the 92 historic counties (plus Welsh language versions for Wales). Further information about the Association of British Counties and the historic counties can be found in our Press Packs on the Press and Media Page of our website; alongside maps and images for download, and this and other press releases. The ABC believes that the historic counties are an important part of the culture, geography and heritage of The United Kingdom. The ABC contends that Britain needs a fixed popular geography, one divorced from the ever changing names and areas of local government but, instead, one rooted in history, public understanding and commonly held notions of community and identity. The ABC, therefore, seeks to fully re-establish the use of the historic counties as the standard popular geographical reference frame of Britain and to further encourage their use as a basis for social, sporting and cultural activities.